The Sonoran Desert Tortoise is a candidate for the endangered species list. Species description: Adult tortoises range in length from 8 to 15 inches. They have a relatively high-domed shell, usually brownish with a pattern and prominent growth lines. Habitat: They are associated with the Arizona Upland and Lower Colorado River subdivisions of Sonoran desert/scrub and Mojave desert/scrub vegetation types on rocky, steep, and lower mountain slopes. 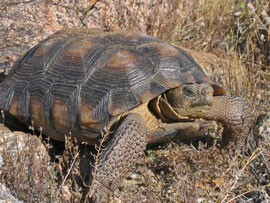 Interesting facts: The desert tortoise can acquire almost all of its water from the plants it eats. It may spend up to 95 percent of its life in burrows. Adults are generally solitary, and the males are especially combative with other males. Arizona developers could face some obstacles if federal officials place the Sonoran Desert Tortoise on the endangered species list. It could mean more restrictions on where and what land they can develop. And that’s exactly the kind of issue leaders of Arizona State University’s new land ownership real-estate initiative plan to tackle. The initiative, based out of the W.P. Carey School of Business, addresses the challenges of large land ownership. One of their first projects is figuring out how to deal with the tortoise. The U.S. Fish and Wildlife Service will make the determination whether to place the tortoise on the endangered species list. Officials will base this decision on threats -– from disease and predators to destruction of its habitat -– the animal faces. Officials expect a draft of the agency’s decision by September. The designation poses a potential problem for developers because the tortoise has historically lived in the southern half of Arizona, which includes the Phoenix metro area, said Bill Boyd, legislative policy administrator at the Arizona State Land Department. The Phoenix area now enjoys a competitive edge against other states, said Vanessa Hickman, program head of the land ownership initiative. “The cost to develop is relatively low and the cost to purchase in the greater Phoenix market is relatively low, which makes us more competitive than other areas,” she said. If the government adds the tortoise to its endangered species list, that could reduce the availability of land and drive up costs, she said. It also could affect agriculture and grazing in the state. That’s where the initiative would step in and bring together the stakeholders: from real-estate developers and government regulators to agriculture representatives. The initiative and the U.S. Fish and Wildlife Service are pursuing ways to offer incentives to landowners who proactively work to protect the tortoise. Steve Spangle, a field supervisor for the U.S. Fish and Wildlife Service, said while the initiative is working to minimize the economic impact the listing could have on real estate, stakeholders still need to keep in mind that his agency is required to meet federal law. “There are remedies we can take, but people have to come in and see me sooner rather than later” if they want to take advantage of any incentives, Spangle said. Wild Earth Guardians, a New Mexico-based environmental organization, has fought to add more than 800 species protected under the Endangered Species Act. “Our main hope is all of the agencies that have a role in permitting development take a time out to stop contributing to the demise of the Sonoran Desert Tortoise,” said John Horning, the executive director of Wild Earth Guardians. He said he hopes the potential listing slows down real-estate development, which causes fragmentation and isolation of the species. As for Hickman, she said she’d rather not see the tortoise listed. But that’s only because if the U.S. Fish and Wildlife Service believes the species does not warrant listing, it would mean the population is doing OK, she said. The Sonoran Desert Tortoise is a candidate for listing as an endangered species, which could have implications for real-estate development.